An industrial strength version of the oldest garden tool. A dibble (or "dibber," either word is proper.) is the world's oldest garden tool--a sharp stick. 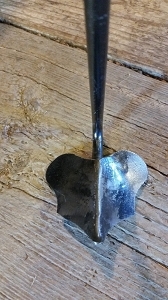 Farmers and gardeners used to make their own dibbles, either "L" or "T" shaped, out of appropriately configured branch crotches. Since the early 1900's dibbles have been manufactured mostly out of wood with a metal cone around the tip. The best dibble ever made, bar none, was produced for many years by a forge in Bangor, Maine; the Snow and Nealley Company. When they were sold a few years ago, the new owner discontinued their venerable garden tool line. So, I decided to reprise their dibble. The bullet-shaped shaft is hand forged from one-inch diameter bar stock. The grip is hammered from half-inch bar and fitted with a hardwood cob. You don't have to push this tool into the ground--just hold on as it drops. It will easily penetrate almost any soil. Then wiggle it around to make a hole the size you want for your seeds; bulbs or seedling plants.